This was a second chance to see OTT's successful exhibition which recently appeared at the RHS Gardens at Hyde Hall, Essex. 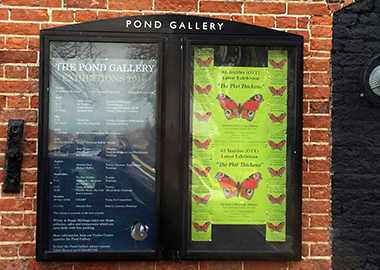 The show was a great success for the Group and the opportunity has been taken to take the exhibition to a new venue in the “Pond Gallery” at Snape Maltings. It included new work to replace some of the pieces which had been sold at Hyde Hall. Please click on the poster below for images of the exhibition and the work on show in it.